Benny Hinn - A "New" Dark "Anointing"
I have been receiving e-mails and watching Benny Hinn for the last few nights on TV. This new turn toward the "dark side of the force" (you know, the "force of faith") with Benny and his wife is revealing, disturbing, and saddening. First we were treated to a video tape on Comedy Central's "God Stuff" of Mrs. Suzanne Hinn shouting that some Christians need "a Holy Ghost enema up their rear ends" and then proceeding to scream and slide across the stage on her belly. Not be be outdone by his wife, Benny Hinn has recently been seen growling in a weird voice, laying curses on Christians who disagree with him (this is nothing new), knocking children down with "slain in the spirit" while yelling things like "Fire" and "Execute him", and prophesying over Paul Crouch with what I can only describe as a papal air. The new "pope" of Charismania, Benny Hinn, is making sure to have all the leaders of the Third Wave on his interview style program these days such as Kenneth Copeland, Rod Parsley, Joyce Meyers and Rodney Howard-Browne. This is so we and they will be sure to understand that it is really Hinn who is the apostolic father with the greatest amount of the "anointing". What's next? Crouch and Copeland kissing his ring or feet? I guess since he knocked Paul on his backside, when in an earlier "Praise The Lord" show Crouch had made fun of people who fall backwards needing catchers (interestingly Paul needed one) Paul was right down there next to Hinn's big toe and should have kissed it while he is there. We now have these reports streaming in from viewers of the "new" (is anything these people do "new" or even interesting) Benny Hinn "anointing". Did anyone happen to see the above program last evening with Benny Hinn as guest? Benny was speaking of what happens to him under the "anointing". He stated that his very own "children" are afraid of him when he is under the "anointing". QUESTION: Was anyone afraid of Jesus or the Apostles when they walked under the anointing? Why and What are the children afraid of? They showed a clip of Benny's meeting, I think in Springfield and I was amazed, his voice changed to a "growl", he was telling the people to raise their hands to the master he serves, it was so obvious that he was not talking about the Jesus of the Bible. He also cursed all who would raise their hands against his ministry in word or deed. All I can say is WOW, I have not witnessed anything like this since prior to my getting saved and seeing this in "channeling". His voice sounded like Katherine Kuhlman's, his lips mouthed like hers when she used to speak (I have seen video's of her speak) and his arms and mannerisms were those of Katherine Kuhlman. The auditorium was packed, the people there were falling under some kind of delusion. If anyone saw this please let me know what your thoughts are, please. An aside. A Kuhlman "anointing"? 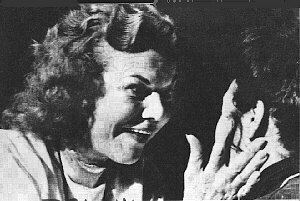 Have you ever seen a picture of Kathryn Kuhlman? How about this one? I rest my case! Back to the e-mails. for protection if you do. He comes right out and puts a curse on anyone who says a word against this so called move of God. I still can't get the sound of his voice and his look out of my head.... truly a very frightening thing to see. The Benny Hinn program I taped off of TBN was not on the Praise the Lord program, but was Benny's own show. And you'all are right -- he's really been taken over by something ugly. On the show I saw he laid hands on Paul Crouch who fell backwards into the hands of some catchers -- Just an aside, but I have an old tape of Hinn telling Crouch that he only has catchers for those who fall by suggestion, when the Spirit slays someone they don't need a catcher, said Hinn. Paul agreed and said, yeah, some think they have to fall to get it -- and the two of them had a big laugh. Looks like the laugh's on Crouch! Then after Crouch got slain, singer, Steve Brock went into tongues in a guttural voice and then translated it as some big message from God for the people to take on demonic powers. Throughout the program Hinn's voice was not his normal one. I'm glad this list clued me in so I could tape him today. I produce discernment tapes and I'll need these. Another guy I taped on TBN today, Casey Treat, carried on about dogs having puppies, cats having kittens, and God having gods. Then he said that he got into trouble some years ago making that statement and that he was quoted in some book. He went on the say that that book is what gave him an international ministry. "And where's the guy who wrote that book today?" he added, to say that he's nowhere. Well he doesn't know that Dave Hunt has never missed a beat in exposing such garbage and the question, "Where are they today?" will be answered in the future when Dave's in the presence of the King and Treat is a little god in the other place. Thank you so much for your response. I was alone when I saw this on TV and I was beginning to wonder if I really saw what I thought I saw. How can one have fear if the anointing of the one true God is present. I would be awestruck by the "love" flowing from God's anointing, being a true believer. Acts 9:31: Then had the churches rest throughout all Judaea and Galilee and Samaria, and were edified; and walking in the fear of the Lord, and in the comfort of the Holy Ghost, were multiplied. talks about when Paul came to them and began living among them and teaching the Gospel. They had "rest", they "walked in the fear of the Lord"
Job:28:28: And unto man he said, Behold, the fear of the Lord, that is wisdom; and to depart from evil is understanding. and the comfort of the Holy Ghost. What a blessing being under the discipleship of Paul. Psalm 34:6 This poor man cried, and the LORD heard him, and saved him out of all his troubles. 7: The angel of the LORD encampeth round about them that fear him, and delivereth them. 8: O taste and see that the LORD is good: blessed is the man that trusteth in him. 9: O fear the LORD, ye his saints: for there is no want to them that fear him. 10: The young lions do lack, and suffer hunger: but they that seek the LORD shall not want any good thing. 11: Come, ye children, hearken unto me: I will teach you the fear of the LORD. Wisdom in His Will and His Ways is what we should be seeking, not the sensationalism and hype being fed by the apostates of today. I believe the Word is not only warning us about the "Antichrist" to come, but the "antichrist" spirit that abounds in the world today. I pray brothers and sisters that you will hold fast to the "truth" which is in Christ Jesus. The Trash Broadcasting Network (TBN) show you wrote about that featured Hinn aired on Fri. Because of your report I made myself watch the rerun Monday. You are so right. he was channeling an evil spirit. Hinn felt he needed to prepared the people for this video clip and warned them about what they would see and hear. His concern was that "less mature" Christians would not understand why he was strongly cursing people. He even said that this "anointing" was very scary to him. The Scriptures he used to justify his placing curses on people who would call his works of the devil were truly twisted. He compared himself to Saul by saying that when the "spirit" came upon him he turned into another person. He was definitely "growling" at everyone and speaking in a different voice with different mannerisms (unless Kathryn Kulmans spirit has come upon him!). He didn't seem to realize that he had given himself over to evil spirits. A few other things about this show I would like to mention... Crouch was at this meeting in Denver and told how Hinn had the gold dust on him. Crouch told about the time he was at a Copeland meeting and a lady manifested a bloody stigmata in her hands and head. ... The only good thing about this was that the devil was out in the open; clearly showing his method of operation. This Hinn performance was a live demonstration of the Holy Epistle of Jude. Showing the way of Cain, the error of Balaam and the gainsaying of Korah as a raging wave with hard speeches, having men's persons in admiration because of advantage (he prophesied to Paul Crouch). This show crossed the line from flaky false teaching to demonic channeling and all that goes with it. I didn't see the program, but was reminded of Dr. Kurt Koch's book OCCULT ABC, and his own experiences in his many visits to the Kuhlman healing sessions to research her ministry. What Barbara and Lynn are saying is what Dr. Koch saw at the many meetings he attended. [See pgs. 110-121 of above book.] Quite revealing, likening the falling backwards as she ministered, to psychic contact which he had seen in action for over 45 years in his ministry. He apologized for having to report on this lady but said the church has a duty to test the work of leaders and the keep the Church of Christ informed. The works done by these people will stand or fall before the Lord, he said. It is difficult to imagine that the entire audience that saw Hinn and these "transfiguration" forces at work were unable to discern what was taking place. The delusion must be very powerful. I was just talking to a friend about the Benny Hinn-do-ism news and we were noting that Benny Hinn would sure make a good candidate for the false prophet of the book of Revelation who would cause all to worship the Beast. After all, he was born in Israel, he has a huge Catholic following and the whole charismatic world is bowing before him. This week on Hinn's program his in-studio guest has been Rodney Howard-Browne. Hinn used to be against RHB's holy laughter manifestations, but by the looks of the Denver crusade he is now having the same result, so now RHB's OK with him. Did any of you catch the Denver footage on Hinn's show yesterday? He brought up children ranging in age from 7 to about 16 for the anointing. He had the whole stadium yelling "Fire!" at them over and over again and they shook and cried and some flew through the air at Hinn's touch, as Hinn shouted in his new gravely voice. It was a frightening sight. And what's so scary about it is how the crowds are flocking to him by the thousands. His stadium are overflowing, unlike Madison Square Garden was for RHB. Years ago, we handed out info packets to people coming to a Hinn crusade in downtown Philadelphia and the local newspaper reported that about 14,000 did not make it in. I can vouch for that because it took me 2 1/2 hours to make a 20 minute trip due to snarled traffic. Don't you think the false prophet will have this sort of reaction from an apostate people? The same friend I spoke with today about Benny had one time asked me, "What would happen if a pope had the same sort of occultic power as Benny Hinn?" Could you imagine people flocking to Vatican Square to "get a touch from God" in the manner they do at a Hinn crusade? Or if he doesn't have that kind of "charisma" he could sure make use of such a one to help him in his own ambitions. The possibilities are dreadfully real. More reports in a long line of reports on more blasphemous material vomiting forth from the TV into homes all across the world. Frankly, I'm tired of even having to cover it and feel like my hands are dirtied when I repeat these things by typing them into a report. But Christians must be warned and so few are up to the task or warning others or discernment -- willing to pay the price of curses and persecution. So many Christian leaders today, rather than risk turning their audience off with straight talk, spend their time on TBN sitting in gold chairs jostling elbows with Paul Crouch, or chatting kindly with Pat Robertson and the "word of knowledge" crew on the 700 Club, while they don't even realize they are being used to further the gospel of apostasy. When will Christian leaders take a stand against this stuff? Do they think that they can sway the hearts and minds of people who, at the same time, see them compromising their message by tacitly endorsing people like Crouch and Hinn? Proximity is worth a thousand words, in my opinion. It is high time for true Christians to get off those networks. Here's an idea ... start your own! Start "contending for the faith" and "demolishing arguments" like we should be doing, instead of having a lovely tea party with Jan Crouch. Hinn has long since stopped listening to rebuke from Christians or from the Word, that is clear. I pray for him that he will somehow be delivered, but it looks like he has charted his course and it is firmly set. We as Christians must be just a firmly set against what he is teaching and doing. We must warn others before they fall for the same demonic delusions as others have at these kinds of Third Wave three ring circus occult meetings, and around the world on television.